What a week it has been so far! As I mentioned last week, I am participating in a Proverbs 31 Ministries Online Bible Study. I have jumped into it feet first because struggling with my weight and being healthy in general is something I battle with month after month, year after year. I am taking advantage of every opportunity I can get to join in to learn from other people and share in their triumphs and encourage them in defeat. Because I am taking this seriously and not being blasé about it, I am feeling empowered! I am not alone in my struggle and I have sisters in Christ who are feeling the same way I am. But with the power of Christ in us, we are overcoming our physical cravings and satisfying them with a spiritual one - craving God! My soul yearns, even faints, for the courts of the Lord, my heart and my flesh cry out for the Living God. But this week hasn't been easy, either. I still have to be conscious of what I am putting in my mouth. I have to make the decision to work out. And because it being so cold and snowy here, I just want veg on the couch and watch TV. I haven't had victory in every decision I have made, but I still feel empowered. I don't have to let one bad decision derail me. It is celebrating the small victories - drinking more water, eating more fruits and vegetables during the day, getting on the treadmill. Resisting the cravings of this world is going to be a life long battle. And it isn't always going to be food doing the tempting. It could be the craving of material possessions or the craving of me-time. But just as Christ has given the power to overcome food cravings, His power is more than sufficient to satisfy those cravings, too. God is sufficient and the reminder today empowers me in my journey as well. Blessings, Mary! That is a great reminder, Mary. God is sufficient. He is everything I need. I agree, Colleen, in that there will be other things to tempt us besides food. My sister was telling me that a missionary said that they told some friends who are in a Communist country in Asia that they are praying for them. Do you know what the response was? "We are praying for you!" I don't remember their exact words, but the gist of it was that due to our easy lifestyle it is so easy to forget God. Jennifer, it is so true that as western Christians, we treat our relationship with God so casually. If we are to crave God, He needs to be everything we are living for. Colleen first of all, I loved your blog! Thank you for sharing! I am also from the Heartland (Iowa to be exact) and am tolerating the wind chill warning that caused school to be canceled today. I randomly pick blogs each Blog Hop to read, but what drew me to yours was the picture (I'm sure it has a tech name, I'm just not so savvy!). I am going to become a follower of your blog! Blessings fellow OBS sister! Thanks for stopping by! Your comment made my day! I love the Heartland. It is a great part of the country to be from. Stay safe and warm on these frigid days! I've done very little blogging myself, so today is a good start back! I thing this study will be good for me. Let's "press on toward the prize" together! Janet, I love your description of exercise! :) I am still waiting to experience that exercise high that people talk about. I love that we are not in this alone! We are here to encourage one another and I know God is happy to see his children come together to work to draw closer to Him. As an OBS Small Group Leader I can tell you that we're all having the same issues. It takes a mighty God to help us. Praise God, we have one. Thanks for sharing. I echo your praise! Thank you for stopping by! Thanks for sharing. I am also having small victories this week, but not in every decision. I have managed to workout either outside or at the gym 2 days this week. I am part of a group on Facebook where we post our weekly goals and we hold each other accountable, even in the bad weather. That is great that you have worked out 2 times this week!! I also like the idea of posting goals for the week to help keep us accountable. I may try that with my own small group! Thanks for sharing. Your post inspired me because you aren't going to let what you put in your mouth overpower the relationship that you have with Jesus. I am glad that I could be an encouragement to you. It isn't something that is easy because that instant gratification can be so good in the moment. It is the feeling afterward that is hard to deal with. The feeling of letting God down because he doesn't want my cravings to be a hinderance and letting myself down because I gave in so easily. I pray you grow in your faith as you continue through this study! Sounds like you are in the right place to begin this journey and I look forward to receiving your encouragement and giving some along the way! Let's seek the Lord and he will direct our path, even when it comes to food! I loved your last sentence about seeing the Lord and he will direct our path, went when it comes to food. Food and my craving for it has never been a topic I have brought before the Lord, but I am learning it is something I need to do. 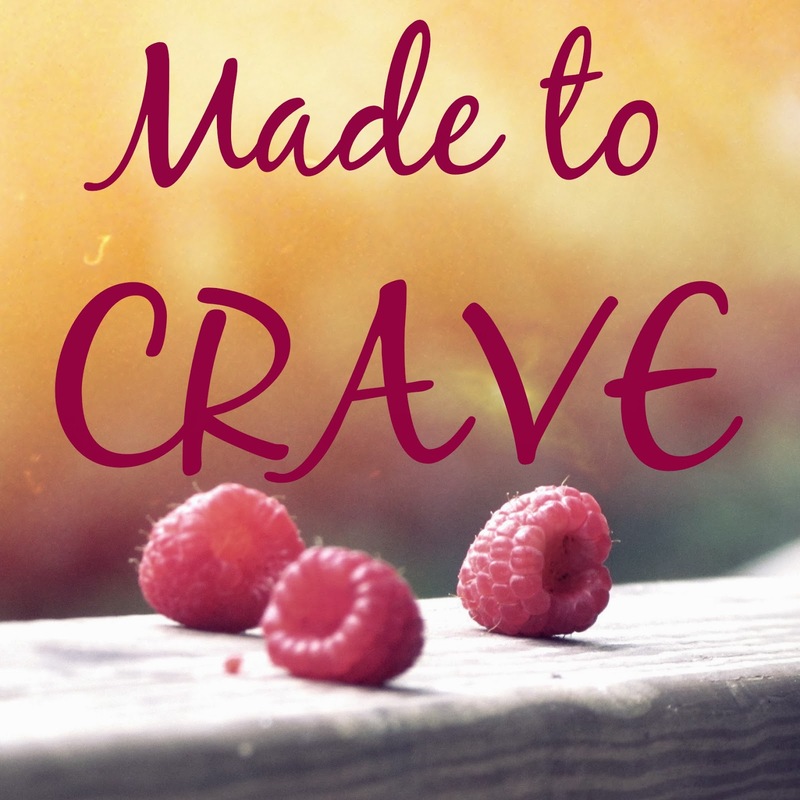 Made To Crave - You're Invited!